Brazil nuts are a must for athletes - and everybody who wants to enjoy! Brazil nuts - exotic delight from the tropics! Our Brazil nuts are a very special treat. They come from Brazil, as the name suggests, more accurately from the Amazon. They supply you with plenty of energy and are easily digestible. 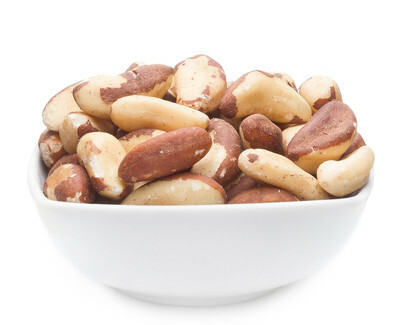 So if you are looking for a healthy alternative, Brazil nuts are a safe bet! Brazil nuts are always collected in the wild since up to this day no one has succeeded in cultivating them. Maybe that's the reason why Brazil nuts are so healthy: they have a large amount of valuable minerals and selenium. Naturally, they are very rich in unsaturated fatty acids and are thus an efficient source of energy on the way! Enjoy the variety of possibilities! Brazil nuts offer you a special variety. Whether baking cakes, muffins or cookies or pimping up your salad making it even crunchier and healthier: Brazil nuts are always a good tip!